Hockey gloves mainly protect your hands and wrists from sticks and pucks. They can also help shield your hands somewhat from the ice when you fall. Padding: Cheap gloves will be padded with single (medium) density foam throughout. This is fairly soft, and is limited in what it can protect against. Mid-range gloves will add a layer of high-density foam on top of this, and better ones will also have plastic inserts on top of that. You can tell what materials are in a glove by squeezing the sides of a foam piece, with quality gloves you will feel the layers. Another benefit of higher-end gloves is extra pieces of padding in certain areas, such as the sides of your hands and fingers (not just the back). Shell: Better gloves will have thicker, more durable nylon shells (material covering the padding). Palm: The palms of more expensive gloves will use a higher-quality, more durable leather, and may be more reinforced in high-wear areas. This type of reinforcement is recommended for players who will be playing on a regular basis as certain areas on the palm will wear out faster than others. 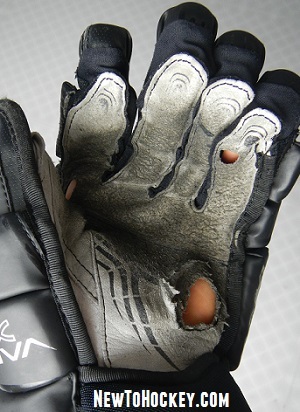 Thumb: All hockey gloves will have an armored thumb which is unable to bend backwards. This is to prevent your thumb from being dislocated if your stick is ripped out of your hands, since they point down the stick. Better gloves will be more mobile in the thumb and wrist (although the fingers may still need to be broken in a bit). If you’re looking at a glove with a fully flexible thumb that looks like the other fingers, it’s probably a lacrosse or street hockey glove. Hockey gloves are measured in (usually whole) inches. 13, 14, and 15” are usually considered adult sizes, while anything smaller is junior or youth. This length represents the distance from the bend in your inner elbow to the base of your fingers. Although this may seem like a strange way of measuring, it is a legacy from when hockey gloves were much longer than they are today. When trying gloves on, make note of a few things for fit. If possible, spend some time shooting and stickhandling with a stick while doing this. You should have about ¼” of space in the fingertips, and when you curl your hand into a fist, they shouldn’t stretch out the material connecting the palm to the glove at the tips. The breaks in the fingers should be comfortable, and should line up fairly well with your knuckles. This can vary from brand to brand, so try everything on! The wrist break should line up with your wrist on the underside. You’ll need to decide what sort of width of glove you’d like. Generally, anything with a 4-roll design will have a fairly wide, “traditional” fit, while other styles can be tight-fitting or in between. You can also choose how much protection you would like. Typically the gloves that provide better mobility have less protection, and gloves that provide more protection (longer cuffs to protect more of the forearm and wrist) will have less mobility. 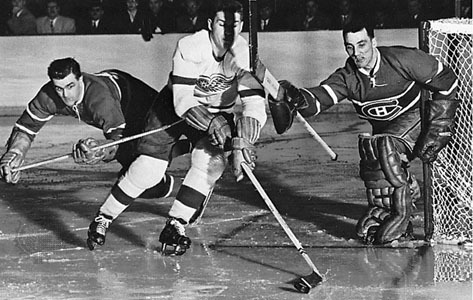 The first thing to wear out on a glove is usually the palm, and typically the palm of the glove that holds the top of the stick (where the tape it). How long this takes will depend on several things, including how often you play, what sort of tape you use, how much you move your hand around, and what quality of glove you have. This can be anywhere from less than 1 year to several years. Your LHS (local hockey shop) will probably be able to do minor patchwork for about $10, or full palm replacements for around $50. If you have lower-end gloves this may not be worth it, but if you would otherwise be buying another set of $150 gloves, it’s something you may want to look into. 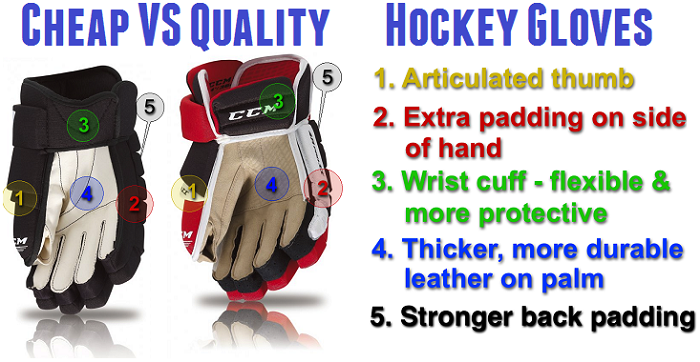 The quality of glove you need depends on the level of hockey you play. If you just play shinny at the ODR with your friends or go out to stick & puck, a cheap one will do fine. If you play in a more competitive league, you are more likely to get slashed from time to time, and should get something a bit better. In this case, look for something at least good enough to have dual-density foam in all of the glove. Used gloves are an option, although they won’t feel as good as new ones – the palm will be quite rough if it’s been used a lot, and will wear out sooner. Also, the leather is more prone to smelling than most other equipment, and if it smells bad when it’s dry, it will smell much worse when damp. 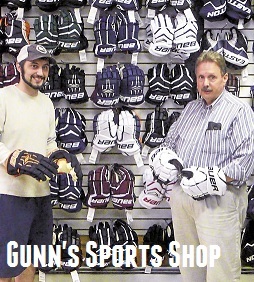 If you have a local hockey shop in your hometown then drop in and try on the large assortment of gloves they have there to find one that you like. Make sure you remember your size and how the glove should fit (found in this article) to help you find the right glove for you. If you don’t have a local hockey shop in your hometown or you know exactly which glove you want then I recommend buying gloves online. 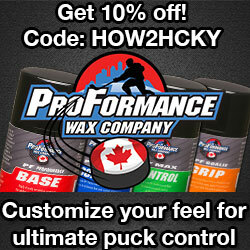 There are a number of popular online hockey stores that have good return policies that I recommend. I have linked to them below, browse their large selection, find a good deal, and if the glove doesn’t fit when it arrives you will be able to return it. If you are looking for used gloves you can search for a recycled sports location nearby, or look in your local classifieds, Kijiji in Canada or Craigslist in the USA. Typically I would not recommend used hockey gloves for adults. 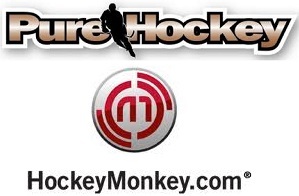 This site was created to help new hockey players and hockey parents by providing hockey equipment fitting guides and other information related to starting hockey. 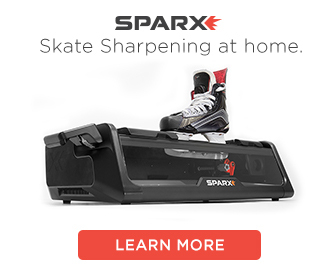 Hockey equipment can be confusing, and more people are looking to buy online. Affiliate links disclaimer - Affiliate links will be used when possible to help support the content creators and maintain the website. Our guides are here to help you make more informed buying decisions, if you buy through one of our links we certainly appreciate it. 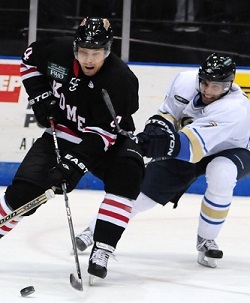 © 2019 New To Hockey – Help for Players and Parents. All rights reserved.